GPS-Photo Link is software that maps your photos. The PC-based software works with virtually any digital camera coupled with a GPS. Use GPS-Photo Link to accurately map photographs for display on a digital map layer such as Google Earth or in a geographic information system (GIS) such as ArcGIS. Create customizable watermarked photos, word reports or html reports. Perform advanced analysis in ArcGIS. Share the geotagged photos, data, and maps between organizations. 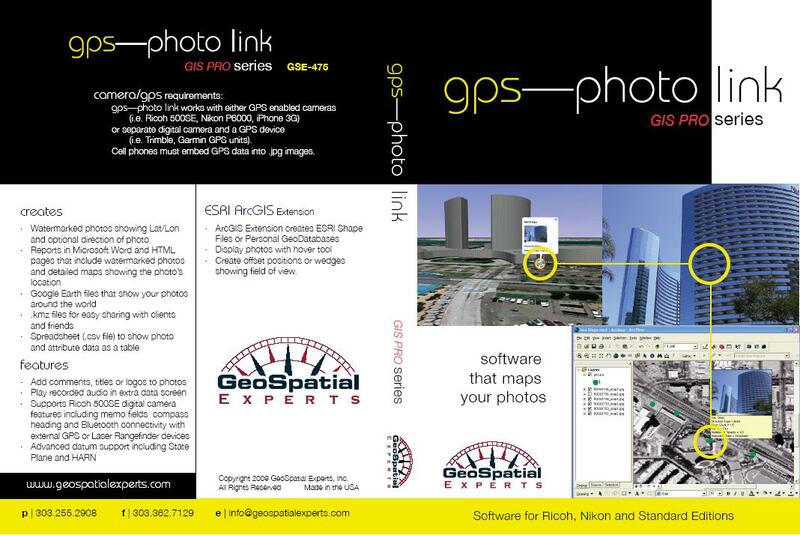 Since 2001, thousands of mapping professionals have been using GPS-Photo Link. Select the Edition you need based on the type of camera and GPS you plan to use. Standard Edition is designed for use with any camera and GPS. Ricoh and Nikon editions have some instructions specific to their GPS enabled cameras.